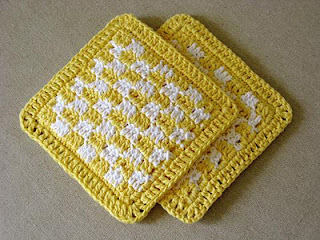 I love the way this set of hotpads turned out. 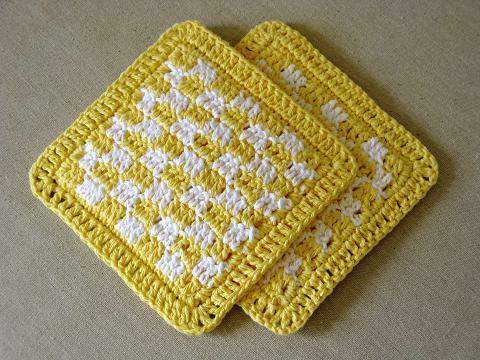 I made them to go into the set that includes these dishcloths and these dishtowels. 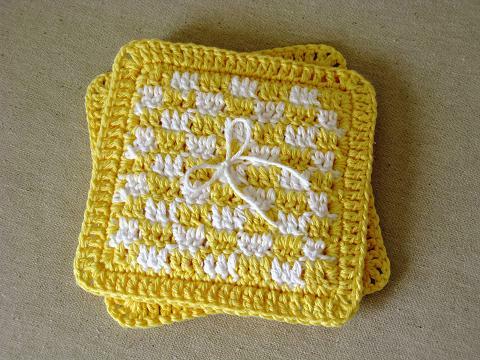 Miss Abigail is also working on this set and has completed this dishtowel, and this dishcloth so far. Because the first hotpad of the set turned out so well, I wanted to make a tutorial with the second. If these directions aren't clear, please don't hesitate to leave a comment or ask a question that will make me clarify. 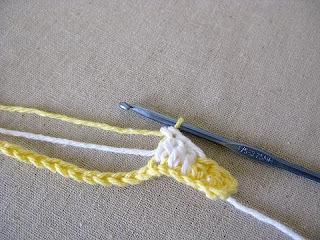 Begin with two colors of cotton worsted weight yarn. I used a size F hook, but a G will also work fine. 1. With color A, chain 24. Dc in the fourth chain from the hook. 2. Dc in the next chain also, but leave the last two loops on the hook in order to change colors. This is called an incomplete dc. 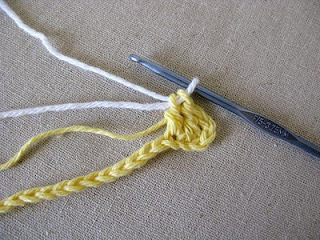 With the last two loops on the hook, drop color A and pick up color B. 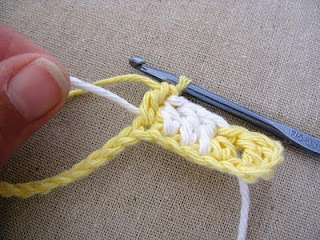 Simply pull a loop of color B yarn through the two loops to complete the dc. 3. Lay the loose color A yarn across the top of the stitches you are crocheting into. 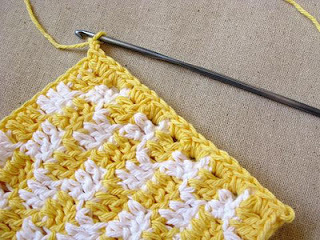 With color B, dc in the next chain, inserting the hook into the stitch from front to back as usual. This will enclose the color A yarn within the stitch and allow you to “carry” it across the row. 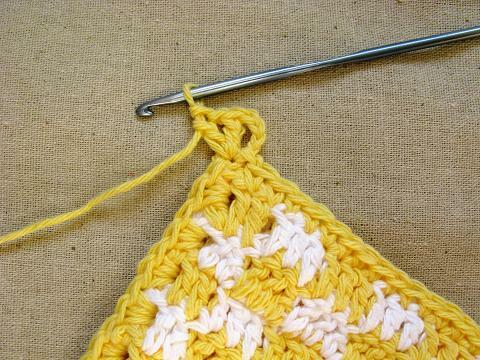 Give a little tug on the tail of the new color to tighten up the stitch in the back. 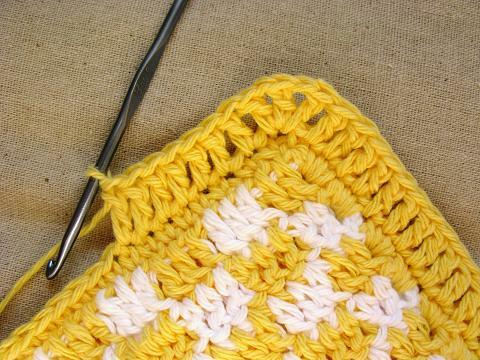 With color B, dc in the next two stitches, carrying the other yarn on top of the stitches you are crocheting into. 4. 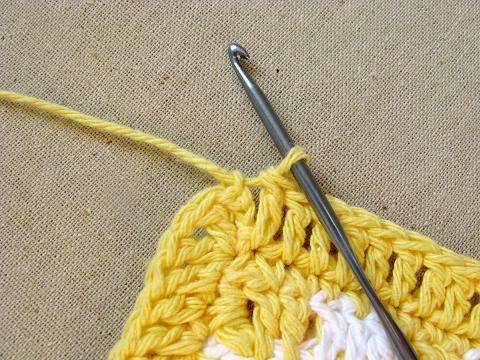 When the third dc is incomplete, with the last two loops on the hook, drop color B and pick up color A again. 5. 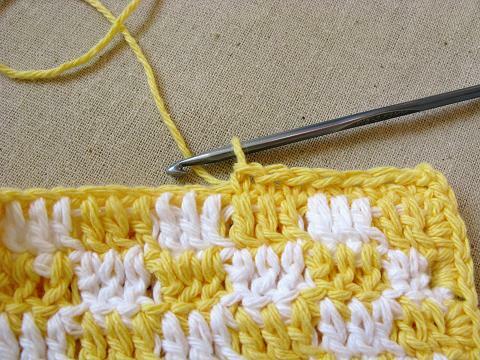 Complete the stitch with color A. Color B will now lay across the top of the stitches and be carried until you pick it up again. 6. 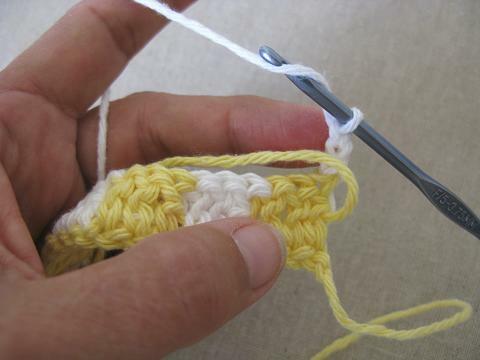 Now and then you may need to tug gently on the yarn you are carrying, to keep it from bunching up inside the other stitches. 7. At the end of the row, change colors again. The color change always happens when the last two loops remain on the hook. 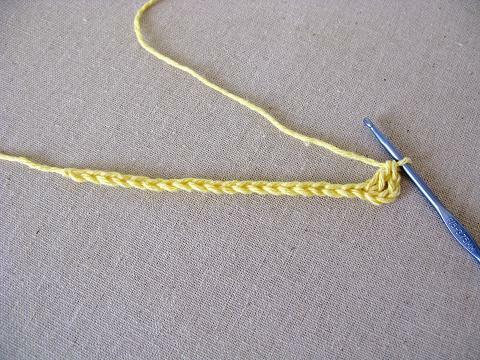 With the new color, chain 3 to turn the row. 8. 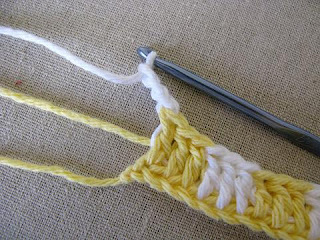 Pull the previous color up and lay the yarn across the top of the stitches as before. Dc in the top of the next two dc, enclosing and carrying the yarn. This checkered pattern is worked in alternating groups of three dc. The last dc in each group is left incomplete in order to change colors of yarn. 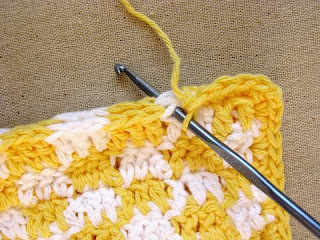 The yarn not in use is carried and enclosed as you stitch. 9. Nine rows total should make the piece square. 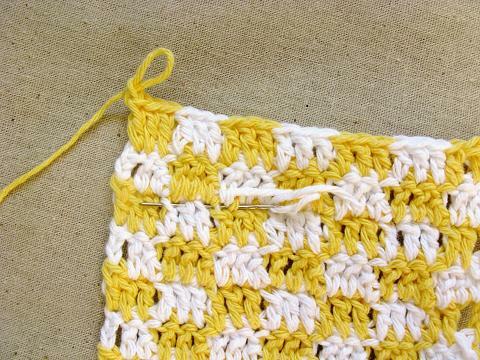 To make the set of hot pads, crochet 4 separate pieces and weave in all the loose ends. 10. Attach yarn at the top left corner of one piece and chain 2. 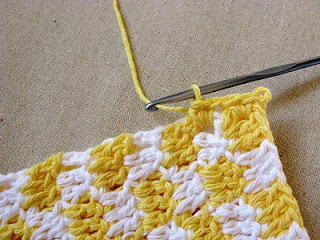 With two pieces together, use a loose sc stitch to crochet the two pieces together down the side. 11. Put 2 sc around the end dc in each row, with 1 sc bringing the corner stitches together. 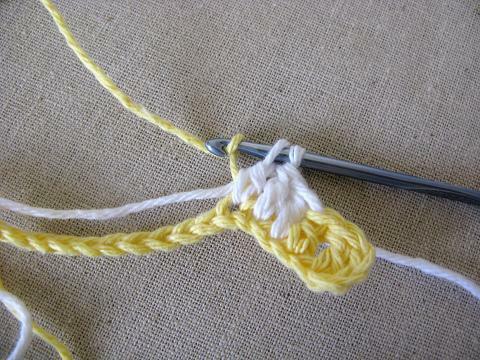 (19 total sc on the sides) Turn the corner with 2 chain and a second sc in the same corner stitch. 12. Sc in each stitch across the bottom, both pieces together. 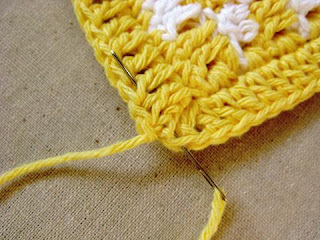 (21 stitches across, not counting the corner stitches.) Turn the corner with (1sc, ch 2, 1 sc.) Crochet up the other side with 2 sc in each row and (1sc, ch 2, 1 sc) in the corner. 13. Sc in each stitch across the top, catching both pieces together. 14. Sc in the beginning corner space to complete the round. To make the final “trim” round, (ch 3, dc, ch 1, dc) in the same corner space to create the initial corner. 15. Dc in each stitch around the edges. Turn each corner with a (dc, ch 1, dc, ch 1, dc). 16. Complete the round with a slip stitch at the top of the beginning ch 3. 17. Fasten off the yarn and weave in the end. 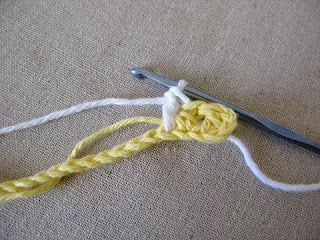 If you like you can add a simple chain loop before you clip the yarn. 18. 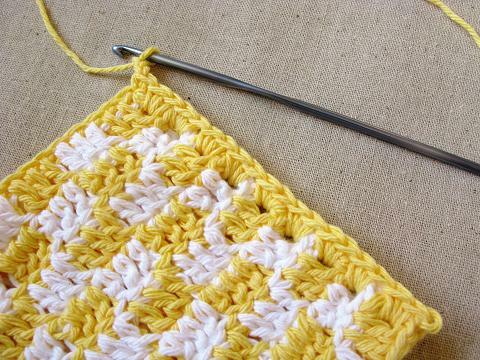 Repeat with the other two pieces to make the second hot pad. Finished! 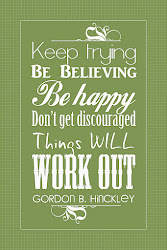 Shared on Raising Homemaker's Wednesday Link-up. Shared on Whipperberry's Friday Flair. Hi! 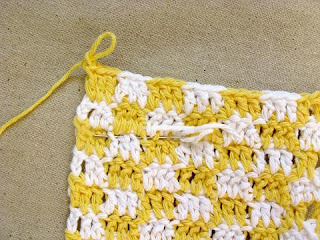 This is such a pretty project, and I can't wait to try it! 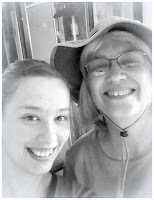 I've wanted to tell you for quite some time how much I enjoy reading your blog. 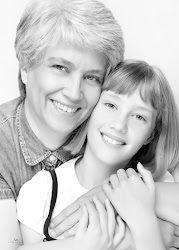 Thanks for sharing the projects you and your daughter do to prepare her for her adult life. I sure wish I'd had training like this as a young lady! One of the things I find so inspirational about your projects is that the projects are often quite simple. I tend to pick overly-ambitious projects that take a very long time to finish and cause undue frustration. Your projects have taught me that simpler projects that are well-planned and well-executed can add such a wonderfully cozy and pleasant feeling to life at home. Thanks! Hello Cami! Your comment just made my day - I'm so glad you find the blog inspiring. That just makes me smile. ;o) - big smile, showing my teeth smile. 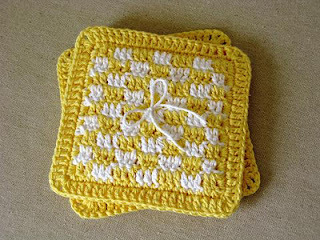 hi, I was attempting this yellow checkered pot holder and I started out with your stated chain 14 but mine does not have the amount of alternating yellow and white colors of three on each row as you show in the photo. Did you perhaps mean chain 24? Yes, Cindy - I meant 24 and I'm so glad you found that typo. I've corrected it and appreciate your comment. THANK YOU! Hi, i see you talk about kitchen sets, can you tell me what goes into a kitchen set? Also if its not too much trouble do u have a list of what should be in a hope chest? Lynn, each of my kitchen sets is a little different. It mostly depends on what I find or design that matches the other pieces I have collected. 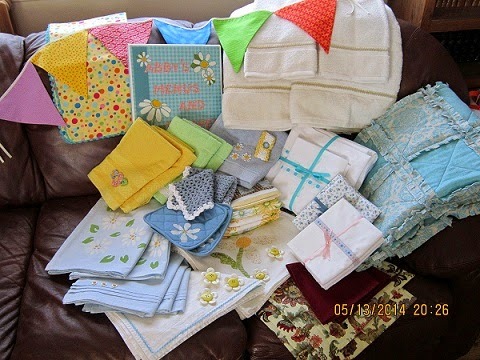 I usually start with an apron or apron fabric and then include at least one and often more of the following to match the apron: dishtowels, dishcloths, hand towels and hot pads. So a kitchen set would be some combination of these items. Then I make an envelope of some kind to hold them together in the hope chest.